Am at A&E waiting to be seen re a very sore hip. Spectacular off just east of Duddingston Rd West. Flew across tarmac like Superman. 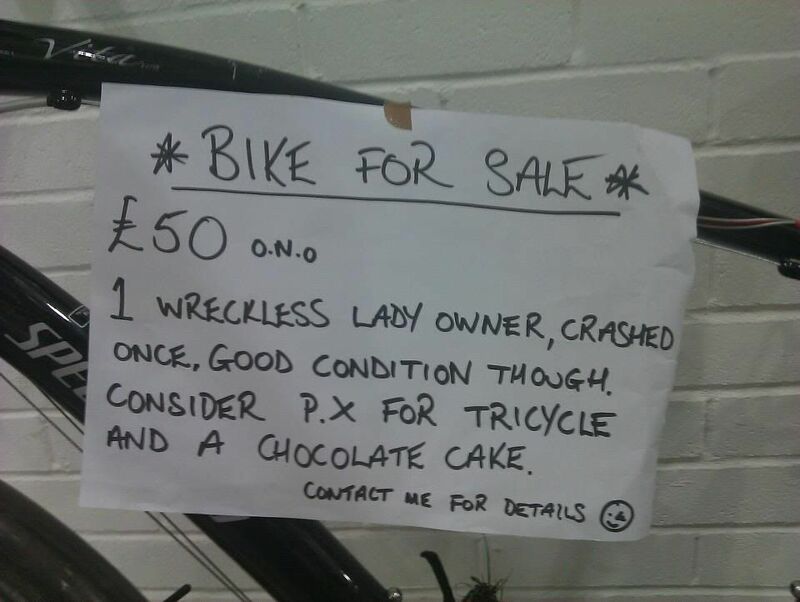 Think the bike's ok.
Hope all is okay. Hugs and kisses and all that sort of stuff you're supposed to send virtually in such circumstances. Ow. At least you didn't have far to go I suppose. :-( Hope there isn't too much damage and you get better soon. I saw a woman walking there this morning though her bike was fine, she must have either fallen of felt she was about to. @Kirst, that's crap :( Hope you and bike are both recovered soon. @Min " At least you didn't have far to go " are you suggesting Kirst isn't very tall??! :( get well soon Kirst! Oaft!!! Sore one! Hope you're ok.
Hope everything's alright, Kirst. Rotten luck. Conditions have been very tricky the past few days, but CEC isn't exactly helping its case. When will the Innocent path be upgraded to a priority 1 route for gritting? No breaks, just muscular. Got a sticl, waiting for lift home. That's a relief. Get better soon. this is ridiculous.look the victim tally on this forum alone! I've not been cycling for the past few weeks because it's been icy and cycling on ice really scares me. But it rained all night and it looked quite mild so I thought I'd give it a go. Was going along the Innocent and it was fine - none of the usual dark icy hollows were dark or icy and all went well until just east of the little bridge over the burn before the gates before Duddingston Road West. All of a sudden I was flat on my front, and sliding and sliding and sliding. I don't know when the bike and I came apart. I knew straight away I was in a wee bit of pain so I lay on my front swearing loudly until I could sit up again, then knelt up for a while swearing loudly until I thought I could stand up. That was tricky because I'd hit a massive icy patch - more like slush than ice. I managed to limp round to our community equipment stores which is in the industrial estate behind the wall and went to check myself over - grazes and bruises mainly, and some hip pain. Decided to try to walk the remaining mile and a half and hadn't even got as far as the chicances when I stopped being able to walk,. Hobbled back to Stores, stuck the bike in the warehouse, and the rapid response driver gave me a lift to A&E. Not the best choice of vehicle - climbing in and out of a transit van isn't easy with a dodgy hip but he wouldn't let me sit in the back. A&E X-rayed me because they thought I might have a fractured pubic ramus, but the X-rays are all fine so it's almost certainly just muscular. They've given me a stick - the nurse laughed when he brought it and I stood up with my arm in position to be measured for it - and gave me an ibuprofen the size of my head which has taken the edge of things. I have to rest it for a couple of days and then do some gentle range of movement stuff with it. Am hoping to be back at work on Thursday. Ouch ouch ouch ouch ouch ouch. There is not a chance I'd be able to get in and out of the bath! :( Shower? Hope you manage to get comfy. Get stores to order you up a walk in bath! Seriously, GWS pet, and you know you're more or less on my route home, so if you need anything dropping off just give me a shout (it'll be easier dropping off tins of baked beans than finding a damnable silver earring under a floorboard...). We don't do walk in baths! You have to sit in them and wait for it to fill up around you, then sit and wait for it to drain around you. Horrible things. Superb thread title. "infirmary" would have given you the clean sweep of Is, but then it took me a few minutes to think of it, and I'm not sat in a&e! I can't be arsed going out for chocolate. I'd have to go to Peckhams for good dark stuff and that's Too Far right now. Im sure its a form of affection. Kirst, get well soon - had a mate off a couple of days ago too - these paths are terrible. Mind you, the pavements were not much better at 6.30 this morning - first day back at work for me today, and the black ice almost sent me back to hospital. p.s. I cant speak highly enough of the CES people, they really helped out with all my equipment needs, and nothing was too much trouble. Lovely team. Kirst - you are joining quite a few 'offs' over last wee while. That sounds really sore - not nice when all you want to do is have a nice Christmas. I've emailed my councillors to let them know that the case for gritting the cycle paths remains valid. From Canonmills to 5ways has been covered by a pavement dispenser (not ideal, because it only grits a narrow strip, but better than nothing. From 5 ways on the big path though - nada. Even the peds were at the edges and my tyres were getting a workout. Which is odd, because today and yesterday I found unseasonably warm (i.e. I rode without gloves after overheating). It does seem odd that the cycle paths seem to be freezing over when roads are clear and ambient temperature seems above freezing. There may be something in the fact they are old railways? penned in on either side by walls or embankments and now trees, sheltered from wind and morning and evening sunlight and with gentle gradients so that cool air can sink to low points (like 5 ways?) and collect. No car traffic overnight. Making them more likely to freeze over? The plot thickens, since there was enough frost on the Stenhouse/Gyle cyclepath that I went back onto the road this morning. That's pretty well sunlit and exposed, and was fine yesterday lunchtime. Fairly high levels of moisture in the air today might contribute. Also, this morning is the first day since friday without a skim coating of ice on at least parts of the canal - and I attribute that to the slight wind making waves more than warmer temps. So, it is probably colder than you think, at night at least. Cars or possibly underground utility-pipes or possibly hard-packedness/conductivity of subsurface. Back when there was heavy frost a couple of weeks back (Sunday 4th) Sleigh Drive's pavement was all frostyslippy whilst the road was all meltygrippyat about ten past nine. Both had had exactly the same amount of light and wind since daybreak. It wouldn't have had much traffic by the time I went along it but was still melted all the way up to the kerbstone.